Leda's 22"x28" painting, Awesome Azaleas II, won the First Place Peoples' Choice award at Arts Round the Square (ARTS) Lake Sumter Landing, April 8, 2018. 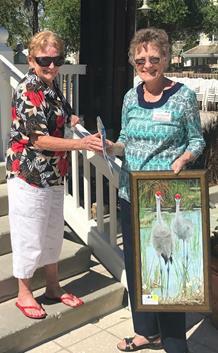 At Arts Round The Square (ARTS) in Brownwood on October 14, 2018, Leda's painting Heron at the Preserve received Peoples Choice Second Place award. First place went to Mike Daley for his painting "Duke." 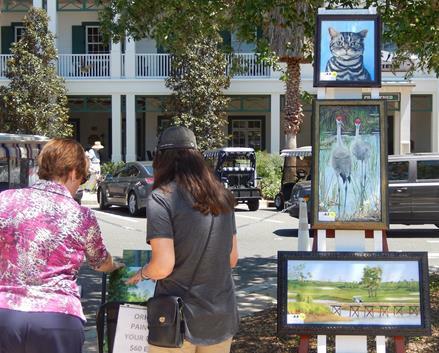 Leda's painting, Redheads, was awarded Peoples' Choice First Place at Arts Round the Square (ARTS) at Lake Sumter in The Villages on Sunday, April 9, 2017. Leda's painting, Siesta Key Turtle Bay II, was awarded First Place at the Arts Round the Square (ARTS) event at Brownwood in The Villages on October 16, 2016. 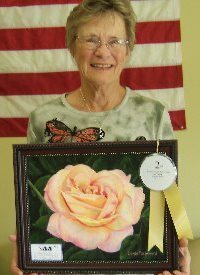 Leda's painting, Beauty and the Beast, won People's Choice award at the Visual Arts Association's Sumter County Annex show on February 2, 2013. 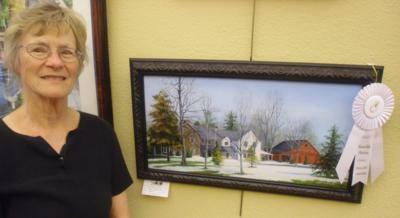 The painting was displayed in The Villages office of Charlie Smith of Morgan Stanley Smith Barney until the next Annex show. ​Honorable Mention awards were received for Awesome Azaleas (left) at Arts Round the Square in April 2012 and for Country Pride (right) at the LaGalleria show in March 2011.